Ok, so last year I had a ‘Top 10’ list. What can I say; 2011 was kind of a struggle. But I did discover a common theme for this year’s favorites: delivering a stellar performance in the face of adversity. Whether it was a legendary performer who had overcome personal struggles to come back, absolutely blazing (Toyah Wilcox, Levon Helm, and Eric Bachmann with his band Crooked Fingers); or just a rough night (lead singer Evan Way of The Parson Red Heads being really sick but soldiering on anyway, and The Drowning Men and their ‘road trip from hell’); my soaring admiration combined with musical prowess to create these special evenings. Happy final day of 2011. Here’s my favorite performance at the BMAs – a scorching set courtesy of The Wandas. So wonderful! Definitely see these guys, if you have the chance. That would be Church of Boston back on September 25, when they supported The Humans, not your usual Sunday service – though could you imagine that? I uploaded this recently, but never mentioned it, so as I recover from my band resources and prep my ‘Favorite Shows of 2011’, here’s a little video treat for you. Take Note! If you’re doing First Night, they’ll be bringing their “posse” once again to the Hynes Convention Center, 900 Boylston Street, starting at 7:30 and going until 11pm. Expanding Awareness: The Year Ahead with Dietrich Pessin – happy 2012! On tomorrow morning’s Expanding Awareness program, Victor and Dietrich Pessin will be discussing the year ahead in astrological terms. Here we finally are, 2012. Mayan prophesy and all that. What will happen on December 21? Will the world end? Will we all become instantly telekinetic? Or will nothing at all happen? Should be an interesting show. They’ll be on 10-11am on 90.3FM in the Boston area, but this show can also be heard after the fact on the WZBC Archive. All of ‘ZBC’s shows are online for two weeks. UPDATE… IT’S DONE! (or at least, for the time being). Check It Out. In a sudden burst of ambition and enthusiasm (we’ll see how long it lasts), I’ve decided to continue something I started last year – a Resource Guide for touring musicians passing through the Boston area, and for those who live here as well. For now, you’ll find a list of area venues, capacity and booking info., and just added, a list of local promoters. Coming soon (I have, what, seven more days left?) I’ll have radio and press, rehearsal space and recording studios, and much more. Have a look. And very happy holidays, everyone. Stay tuned for my ‘Favorite Shows of 2011’, and also some ‘end of year angst’. I’m sure I’ll be able to summon some up for ya. Here’s something a little different from me, in amongst all the existential angst and bitter regrets. Well ok, it’s a song about a lost love, but it’s sung in such a sweetly reminiscent way, you almost don’t feel so bad for him. 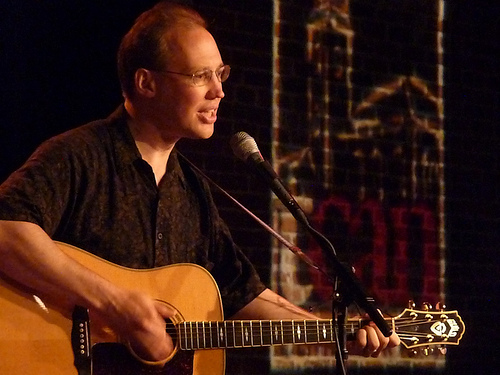 Randall Kromm, lawyer by day, folk singer by night; it seems like a strange dichotomy, but his songs are about real life experiences and everyday challenges, and what can be more real and challenging than balancing the life of a musician with another life as a lawyer, husband and father of four? He’s performed at coffeehouses, open mikes, and clubs in the Boston area, including a sold-out show at the legendary Club Passim, and released his debut album, Water Wheel, earlier this year. He also has a collection of seasonal songs called Holidays and Homecomings. He counts among his fans seasoned performers Christine Lavin and Don White. 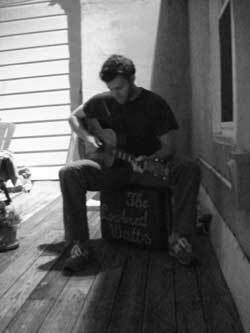 Randall has two shows coming up – a performance of holiday songs with other local musicians at Main Streets Market and Cafe in Concord on December 22 at 7pm, and at an open mic at Emerson Umbrella on January 9, 2012, along with songwriter Laura Gold. On this morning’s Expanding Awareness program, Victor and his guest will be discussing the sacredness of trees. His guest, Bryn Durham, also happens to do foot reflexology, so they might talk about that as well. It’s going on now (10-11am) on 90.3FM in the Boston area, but this show can also be heard after the fact on the WZBC Archive. All of ‘ZBC’s shows are online for two weeks. BOSTON HASSLE Playbutton Release Party – TONIGHT at Great Scott! If you’re sitting there thinking, “how can I be so much cooler than everyone else around me, so that my Boston music scene street cred is forever secured?” , you need to know about this awesome new music compilation. It is in honor of the Boston underground music scene, fearlessly supported by the folks at Body Of Water (B.O.W.) and Boston Compass, who regularly promote shows within a wide range of ‘outside the mainstream’ genres in alternative venues. For this unusual new release, they’ve partnered with The Boston Hassle, a music blog and events guide that specializes in “Psych, punk, weird, pop, electronic, experimental, and awesome music… high and low brow smashed to pieces and forever mixed together.” Attention hipsters: you can now (quite literally) wear your love of underground music on your sleeve. Sleepover Shows Holiday Charity Auction – Signed Band Memorabilia! 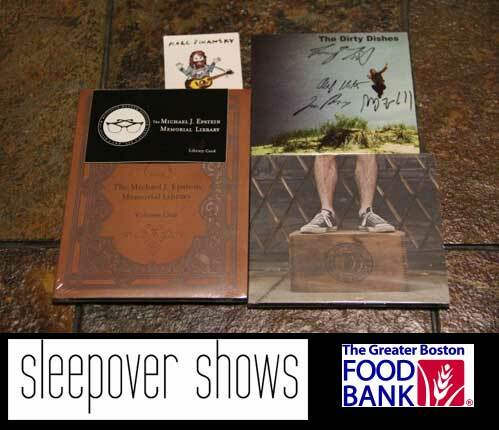 One of the auction items, Boston Bundle Two, features The Dirty Dishes CD (signed), The Michael J. Epstein Memorial Library Vol 1 CD (signed) with sticker, Sodafrog 'Hang the Moon' CD and bonus Marc Pinansky sticker. In the holiday spirit of giving to those less fortunate, Sleepover Shows, the people who bring you stripped down, acoustic sets in curious locales by your favorite bands as they come through Boston, have put together a very special auction, all profits to benefit The Greater Boston Food Bank. Apart from the wonderful cause, what makes this auction so cool is that they’re offering up a load of signed band merch from many of the bands they’ve filmed over the last year. This includes posters, vinyl, set lists, shirts, cds, by well-loved artists such as Frightened Rabbit, Pearl and the Beard, Chris Bathgate, Walter Sickert and the Army of Broken Toys (a poster of their show with Zoë Keating), The Michael J. Epstein Memorial Library, The Motion Sick, Marc Pinansky, Do Not Forsake Me Oh My Darling, The David Wax Museum, Marco Benevento, Marisa Nadler, Mean Creek, and many more. Each item’s photo on the Charity Auction site links to its eBay page, with auctions ending on Wednesday, December 14, so BID NOW! There are a few cool Boston music bundles up there as well, so check ’em out. Visit Sleepover Shows to see their latest sessions, and starting next week, a series of six Boston bands performing original songs, each band naming a charity for people to donate to this holiday season. The Lowbred Watts is the homespun project of Ryan Stapler, who recorded his debut EP, Get Home, on a trusty cassette Portastudio in his basement. But have no fear… it’s really good! His folk & country blues tunes have a warm, front-porch charm. Accompanying himself on acoustic and electric guitars, slide and foot drums, the lo-fi vibe works beautifully with his Dylanesque vocals. Have a listen, and then download the 5-track EP from his website. The Lowbred Watts will be performing at McGann’s Pub tomorrow night, during a fine evening of folk, Americana and country-blues (see set times above). 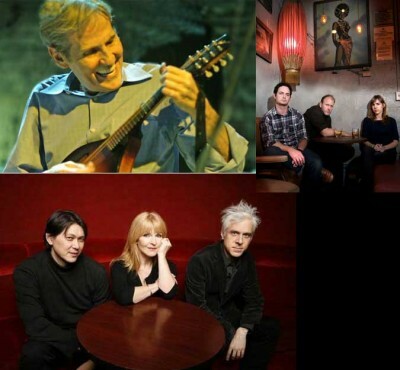 It seems like a well-thought-out lineup of kindred spirits, presented by F Nice Records, who handle all of the live music at McGann’s, and who regularly offer discounted tickets for these shows on their site. F Nice is an indie music company that offers merchandising, show bookings and promotion, rehearsal space, production and distribution, in service to local musicians. “F Nice is here to reclaim the local music scene from those who let it down.” Amen.